Our registered brand to USPTO: Wantdo. The Blue US M is loose fit, choose smaller size if you like slim fit style. The Black US XL is slim fit, please choose one size up for stronger men. Please don?¡t hesitate to contact us if any problems with the item,we will resolve it for you well. Slim fit cotton lightweight jackets. 2 chest flap pockets,2 slant pockets,1 inner pocket, cotton cord with rivet. zip detachable hood,adjustable snap button cuff makes convenience and variety styles. 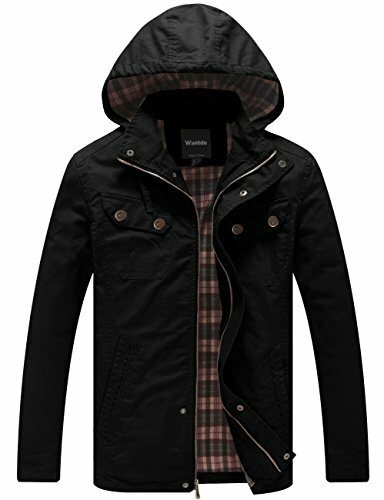 Double closure of front zipper and snap button can better protect you from wind and coldness. Hand wash or machine washable at max 30 degrees centigrade with similar color.